Victims of sexual harassment, race discrimination, gender discrimination, age discrimination, and other employment violations can file an EEOC complaint for free. But what happens after you file an EEOC complaint? What steps will the EEOC take to investigate your claim? And can you file a lawsuit if the EEOC chooses not to pursue your complaint? 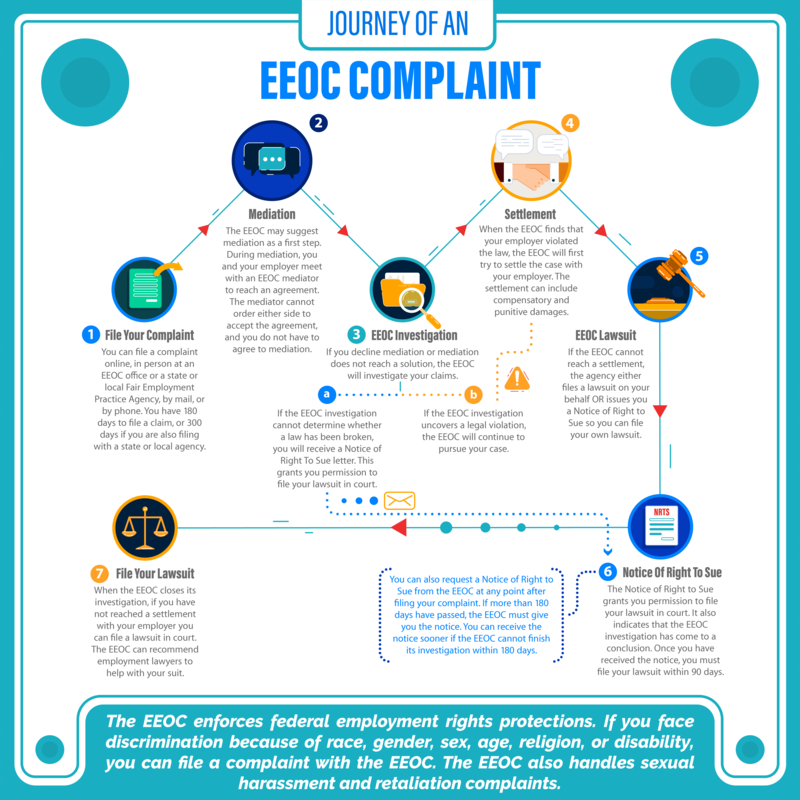 This infographic explains the process of filing an EEOC complaint, including what happens during an EEOC investigation, the role the EEOC plays in negotiating with your employer, and your rights during the process. Victims of employment violations can file a complaint on the EEOC website, visit an EEOC office, or submit a complaint by mail or by phone. Federal law sets time limits on filing a complaint, which can be as short as 180 days after the illegal conduct. You do not need a lawyer to file an EEOC complaint. However, an employment lawyer can help you navigate the process and coordinate with the EEOC. If the EEOC finds no violation by your employer, you can still file a lawsuit after receiving a Notice of Right to Sue. State and local laws may offer stronger protections than federal laws. For example, the New York City Human Rights Law provides a lower standard for proving harassment. Choosing the right employment lawyer can increase your chances of receiving a fair settlement. If the EEOC investigation takes too long, you can request a Notice of Right to Sue. The EEOC must grant you the notice if 180 days or more have passed since you originally filed the complaint. After receiving the notice, you must file your lawsuit within 90 days. An employment attorney can help file your lawsuit. If you are considering filing an EEOC complaint, contact attorney Charles Joseph for a free consultation.